Recall away from distraction and maintain engagement returning back to distraction. With a distraction behind the dog, the handler recalls the dog, attaches a leash and returns to the distraction with loose leash, and then cues one position next to the distraction. Purpose: Demonstrate self-control approaching distractions. Equipment: A distraction (food or toy), leash for dog. Optional: bowl. Exercise set-up: The dog will begin in heel position next to the handler. The exercise begins when the handler cues the dog to stay and places a distraction (toy or treat) on the ground behind the dog. The handler then leaves the dog and walks forward 20 ft. (6 m). The handler may cue the stay again as he/she leaves the dog. The handler then recalls the dog with or without a front. The front position will not be judged. The handler then attaches the leash and proceeds back to the distraction with the dog on a loose leash. The handler can talk or otherwise engage the dog as they return to the bowl or may cue a formal heel once and then proceed quietly back. The team must stop within 1 ft. (0.3 m) of the distraction. Dog must not tighten the leash or go to the distraction. The handler then cues any position within 1 ft. of the distraction. The exercise ends when the handler gives the distraction to the dog, or releases the dog to the distraction. The distraction used should be the same one used to reward the dog during the rest of the level. Non-qualifiers: Dog does not hold the stay when handler places distraction on the ground. 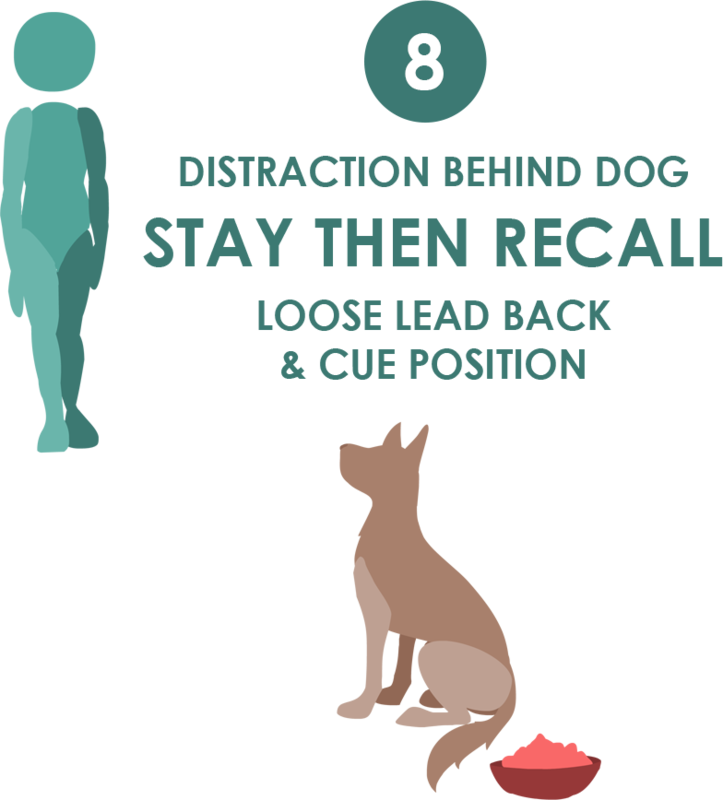 Dog does not wait for a recall cue to come to the handler or does not respond to the handler’s recall cue. Dog grabs distraction toy or eats or attempts to eat the food at any point during the exercise. Dog is unable to maintain an absolutely loose leash when returning to the distraction. Handler fails to return within a foot of the distraction. Handler fails to cue a position within 1 ft. of the distraction. Handler uses verbal cues and control to prevent the dog from taking the food. (A single heel cue at the start of the exercise is allowed; additional cues such as “leave it,” “no,” “uh uh,” or any warning tones are not permitted. If a handler chooses to use engagement and verbal interaction, it should be obviously playful and interactive in tone rather than threatening.) Handler uses a different distraction than what has been used to reward the dog during the level. Dog is sent to take the distraction without first cuing a position. The leash tightens at any point. Video does not permit the exercise to be adequately judged.